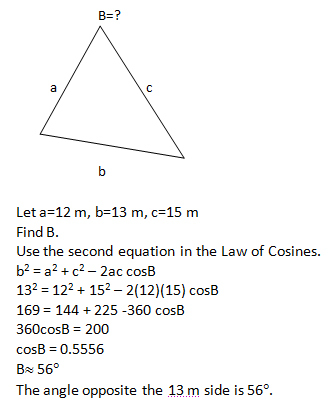 The Law of Cosines is used for solving oblique triangles. In the triangle below, sides a, b, and c are opposite angles A, B, and C, respectively. These three formulas are analogous and we use whichever form is applicable to the problem at hand. 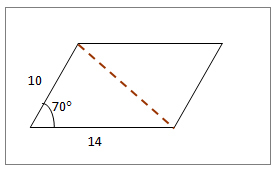 In triangle ABC, a=5, b=3, and C=125°. Find c rounded to the nearest tenth. Two sides and the included angle are given (Type 1). Since we are looking for c, we use the second form of the Law of Cosines. In triangle ABC, a=4, b=5, and c=6. Find A rounded to the nearest degree. Three sides are given (Type 2). 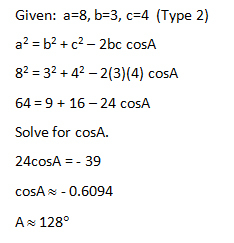 Since we are looking for A, we use the first equation in the Law of Cosines. 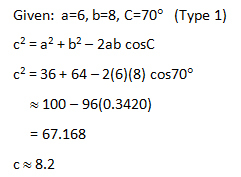 In triangle ABC, a=6, b=8, C=70°. Find c rounded to the nearest tenth. 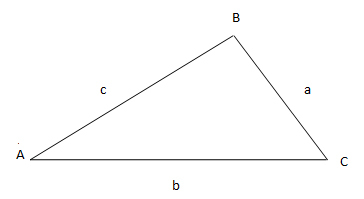 In triangle ABC, a=8, b=3, c=4. Find A rounded to the nearest degree. 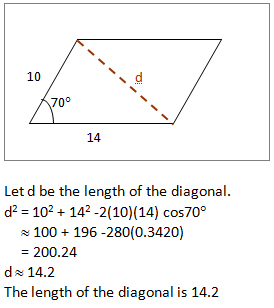 Find the length of the diagonal of the parallelogram in the figure. A rectangular garden is in the form of a triangle with sides 12 m, 13m, 15 m.
Find the angle opposite the side with length 13 m.